Line from the film: "We belong to two opposing sides. If we meet again... one of us will have to die"
As a follow-up to his 2002 film Hero, director Zhang Yimou once again delved into the martial arts genre with House of Flying Daggers, a motion picture every bit as exciting – and just as beautiful – as its predecessor. 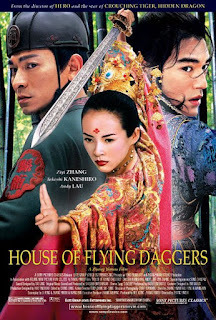 In 9th century China, towards the end of the Teng Dynasty, a rebel organization known as the Flying Daggers is attempting to overthrow the corrupt provincial government. Jin (Takeshi Kaneshiro, Chungking Express), a member of the local police force, is ordered by his Captain (Andy Lau, Infernal Affairs) to go undercover and win the trust of Mei (Zhang Ziyi, Crouching Tiger, Hidden Dragon), a blind dancing girl recently taken into custody. Both Jin and the Captain are convinced Mei is, in fact, the daughter of the recently-deceased leader of the Flying Daggers, and it’s their hope that she will lead them straight to the group’s secret headquarters. After “helping” Mei escape, Jin (who tells her his name is “The Wind”) follows her deep into the wilderness, doing his best to steer clear of the government troops that are trailing close behind. But during their adventure, Jin and Mei develop feelings for one another, causing Jin to question his loyalties; should he continue with his mission, or protect the woman he now loves? In my write-up of Hero, I called it “an all-out attack on the senses” and “an amazing barrage of sights and sounds that never seems to end”. The same can be said for House of Flying Daggers. This movie is incredible; a visual smorgasbord that features one stunning scene after another. Early on, we’re treated to the “Echo Game”, a colorful, wonderfully choreographed sequence in which the Police Captain challenges Mei to a very unusual contest. Equally as good is a later scene set in a bamboo forest, where Jin and Mei battle the government troops attacking them from high atop the trees. These are but two of the many extraordinary sequences to be found in House of Flying Daggers, and thanks to the combined efforts of director Zhang Yimou, cinematographer Xiaoding Zhao, and the movie’s excellent special effects crew, the action-oriented scenes are both thrilling and visually awe-inspiring. While the story itself (which centers on the love affair that develops between its two leads) may not be as grand in scope as the one told in Hero, director Yimou and his writers throw a few unexpected plot twists into the mix to keep things interesting. This, along with its mind-blowing imagery and exceptional fight scenes, makes House of Flying Daggers, like Hero before it, an astounding cinematic achievement that is not to be missed. I want to let you know just how much I enjoy this blog. And I'm happy to learn that I'm not the only one to have seen and commented on "House of Flying Daggers." Keep up the great work.